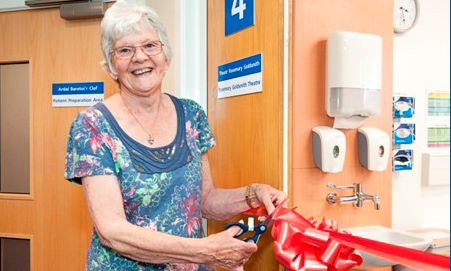 A new endoscopy facility at University Hospital Llandough has been named in honour of the nursing sister who helped set up the service. The Rosemary Goldsmith room is part of a £750,000 upgrade of endoscopy services at Cardiff and Vale University Health Board, aimed at treating more patients and cutting waiting times. The new room will be used for bowel cancer screening and investigations for patients presenting with stomach and bowel problems. Other expansion plans, intended to increase the number of patients treated each year from 10,000 to 13,000, include hiring 5 new nurses and creating a new interview room and a patient preparation room. Cardiff and Vale University Health Board chief operating officer Alice Casey said: ‘The new endoscopy room is a welcome investment, which will help the health board to reduce current waiting times for patients.